Chocolate Banana No Bake Custard Cake - Let the Baking Begin! No bake desserts are a real saver when the weather is just too much to be turning on the oven, but you want something nice for dessert. 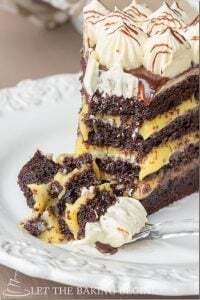 This chocolate and custard dessert is exactly what you need – with chocolate graham crackers, half the work is already done for you, so all you need to do is make the custard and assemble this beautiful and delicious custard cake. This recipe came to me one day when I had a couple of leftover egg yolks from a different recipe. 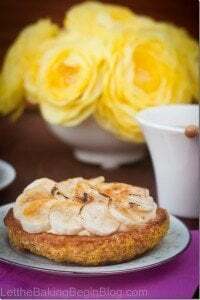 In the following days I made it several times, both with the addition of banana and without, but found that banana was a really nice addition to the flavors that are already there. As I was getting done making this cake I was super excited, because I knew that it was going to be amazing even before the first bite. When you add chocolate, custard and bananas it just can not be bad. When I did have the first bite, it was incredible! It’s nice that it is only a 9 inch cake and I have more than one person in my family, otherwise it would be too tempting to just get a spoon and go at it until you see the other border of the baking dish lol. 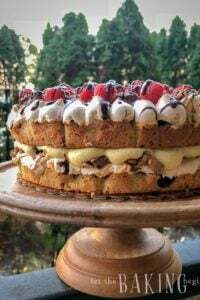 With the 4th of July coming around the corner, you can decorate this Chocolate Banana No Bake Custard Cake with some fresh berries (raspberry, blueberry) for a nice pop of color. Alright you guys, I really hope you get around to making this cake because it’s so so good! You will not be disappointed! Chao! P.S. Stay safe this 4th of July! Add 3 egg yolks, 2 eggs and 1 cups granulated sugar to a medium sized sauce pan. Stir vigorously until smooth. Add 1/2 cup all-purpose flour and whisk together until smooth. Add a little bit of milk to make it easier to whisk (about 1/4 cup). Now add the remaining milk and 1 cup cream in 2 additions whisking thoroughly in between. Add vanilla and whisk. While continuously whisking, cook over medium heat until the custard is thickened and covers the back of the spoon, about 3 minutes past the boiling point. Allow the custard to cool as you prepare the Chocolate Ganache and bananas for layering. Chop enough chocolate to fill 1/4 measuring cup. Pour hot heavy cream over the chocolate and let sit for 1-2 minutes. Stir until smooth. Chop 2 bananas into 1/4 inch slices. Unwrap 2 packets of the Chocolate Honey Graham Crackers and cover the bottom of a 9×9 inch glass baking dish with crackers. You might have to cut some of them into odd shape to do so. Pour 1/4 of the custard (it can still be warm) over the crackers and spread into an even layer. Cover the custard with a layer of Chocolate Honey Graham Crackers. Add 1/4 of the custard and spread. Now repeat with a layer of graham crackers and 1/4 of the custard once more. Cover the layer with banana slices. Top with the remaining of the custard. Cover with plastic wrap touching the custard and refrigerate to make it easier to spread the chocolate ganache on top. Remove the plastic wrap and pour the ganache on top. Spread the ganache into an even layer. Sprinkle with the Crispearls if you wish (optional), or fresh berries. Refrigerate for at least 2 hours before eating. For a clean slice, dip a sharp thin knife into hot boiling water for 10 seconds, wipe with a paper towel and proceed to cut. Do so every time you make a new cut. I love using this cookie spatula from OXO for removing slices, because it is thin, flexible, glides easily underneath the cake and about the size of each cake slice. I actually use this spatula for virtually everything in the kitchen, from scraping the bowl, to turning stuff in my non-stick skillets. As an optional step, you can further sprinkle some colored crispearls on top of the Chocolate Banana No Bake Custard Cake. While not a necessary step, it does make for a fun presentation. See below for instructions on how to color them. Add White Chocolate Crispearls to a small container that has a close-fitting lid. Sprinkle the Crispearls with a tiny amount of any colored Luster Dust. Close lid. Shake until the Crispearls are evenly covered in shimmer. 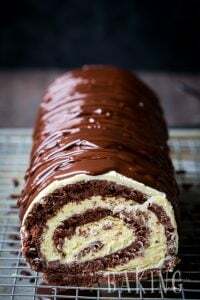 Tiramisu Recipe – A great no-bake tiramisu dessert. No-Bake Honey Cake – Graham cracker layers with soft cream. No-Bake Rice Krispies Cookies – The whole family will love this recipe! Unwrap 2 packets of the Chocolate Honey Graham Crackers and cover the bottom of a 9x9 inch glass baking dish with crackers. You might have to cut some of them into odd shape to do so. I see in the instructions that 1/4 cup of the cream goes into the 1/4 chocolate for the ganache. Should I have added the cream to the milk for the filling? If so it is probably to late to add now that it is cooked. 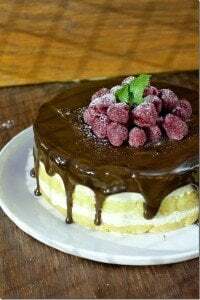 you can add hot cream to the cooked custard and stir it together, if you haven’t assembled the cake yet, since the cream is to be heated with the milk. So sorry this got missed in the instructions. Yes, you can definitely use any kind of similarly flavored/textured cookies/biscuits. Also if they’re about the same thickness, I wouldn’t even crush them, just layer them between the custard and you will be good to go! If the cookies you use are thicker, just let the whole thing sit in the fridge a little longer. Hope this helps!